Institute of Management Technology, Centre of Distance Learning (IMT CDL) is presently on a high pace and rank for contributing towards the dynamic education system in its own way. The organization has fully prepared educational policies with the required agenda, necessary skills and technology. The faculty here are recruited after rounds of proper screening so that the enrolled candidate here are all set to prepare highly accomplish and grown into versatile professionals and in future they will develop into leaders in the competitive business arena. Institute of Management and Technology CDL expands across 6 acres of land and is a complete luxuriant green campus which is just an hour away from Delhi. The institute beholds world-class infrastructure and trending amenities like Wi-Fi, 24×7 broad libraries with a enormous stock of good quality books, an advanced equipped auditorium and well equipped classrooms. The two-year MBA PGDM programme has been divided among a total of four semesters which includes total of 15 core subjects, 4 electives subjects and 1 dissertation project which is taken up in the very last semester. 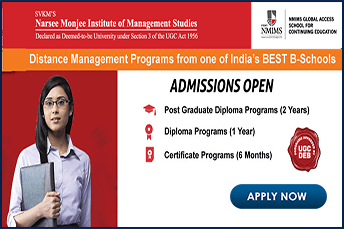 In the initial three semester general knowledge on management courses are imparted to the students which are considered as the important areas allied to management programs in recent times. In the fourth semester the institutes aims at training the students about the contents of their chosen specialization and they have to do a project for the same. The candidates will have to submit a subject of preference from a particular area and also submit the project thesis for the same. Candidates with 60% and above marks in 10th, 12th and graduation. Diploma holders of IMT-CDL’s One Year Programme. 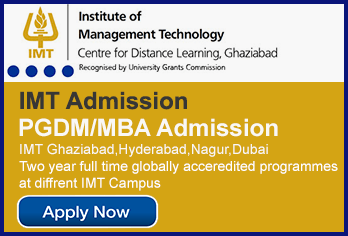 The total course fee for IMT distance learning MBA programme is Rs. 1, 00,000. However, the fee can be paid in equal instalments in four semesters which can be accepted by non-refundable DD only, in favour of IMT CDL, payable at Delhi or via Payment deposited through payment gateway. Institute of Management and Technology(IMT) is one the top 10 business schools of India. 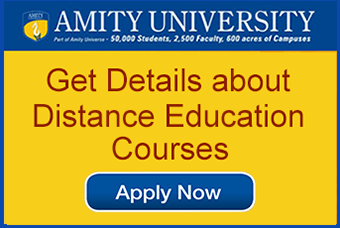 The distance learning courses are approved by UGC and DEB. IMT has been ranked #1 by the ZEE Business for the “India’s Best distance learning B-schools” in 2012. It received the “Award for Excellence in distance education” by 24th Business School Affaire & Dewang menhta National Education Awards in 2016. The university has also received “CSR Top distance learning Institute of India Award” by CSR in 2016 and “Best Institute in Distance/Open Learning” at the ASSOCHAM Education Summit National Excellence Awards in 2015.